The manufacturing industries of Sheboygan may be said to have started with the crude sawmill, erected by William Paine in 1834, midway between Sheboygan and the Falls. Lumber was the first commercial article made and then the manufacture of shingles was but a single step further. Since the small and very primitive beginning, mentioned above, the city of Sheboygan has attained high place among manufacturing cities, not only of the state but also the nation, for in the production of certain styles of chairs Sheboygan is the leader of all competitors. In 1868 the manufacture of chairs was begun and Sheboygan eventually acquired the soubriquet of the Chair City. She became famous as such the country over, and the civilized world for that matter, as her chairs are in universal demand. 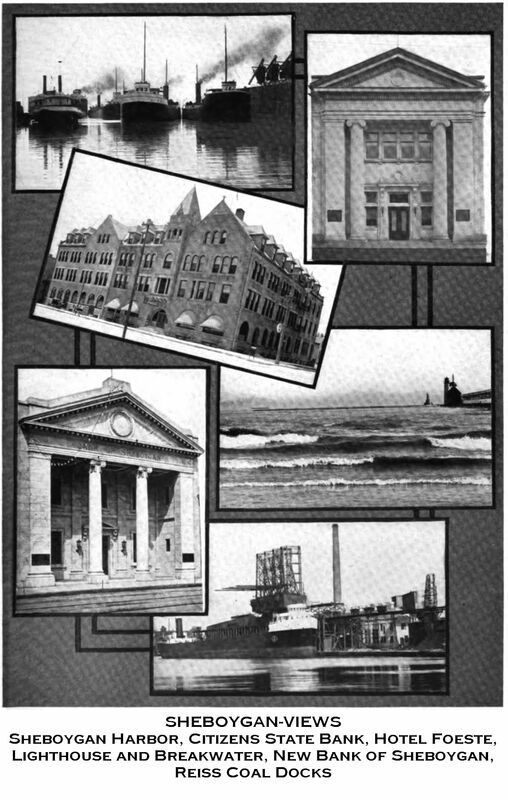 By 1891, Sheboygan was listed as a manufacturing center to be reckoned with when other industrial centers were considered. About this time some of the largest establishments in the country for the manufacture of enameled goods were founded and iron products, knit goods and various and numerous other articles began finding their way into the marts of the country from Sheboygan factories and mills. Prior to this, however, was the early establishment of the Gutsch brewery, in 1847, and the Roenitz tannery, in 1853, two industries that take front rank in their own especial field. The American Hide & Leather Company, tanners, with factories at 702-740 North Water street, is one of the largest concerns of the kind in the country. It was established in 1853 by C. T. and William Roenitz, brothers. They had been in the United States but three years, and with a few hundred dollars saved from their wages they engaged in tanning hides, employing one man. The business increased rapidly, however, and by 1874 the tannery was turning out eight thousand hides a year. In 1875 William Roenitz died and C. T. Roenitz became sole proprietor. Frank L. and Charles H. Roenitz, sons, became associated with their father in 1881. The firm name was then known as C. T. Roenitz & Sons. Forty men were then employed and about six hundred hides turned out each week. The company was incorporated in 1888 and capitalized at $100,000. C. T. Roenitz was president ; Frank L. Roenitz, vice president; Charles H. Roenitz, secretary. C. T. Roenitz died in 1892, when Frank L. Roenitz succeeded his father as president. The business so increased by 1896 that the factories were turning out about eleven hundred sides of leather per day and employing three hundred men. In that year the concern went into and formed a part of the trust known as the American Hide & Leather Company. A short time after the Roenitz brothers started their tannery Christian Heyer began the business of tanning hides. 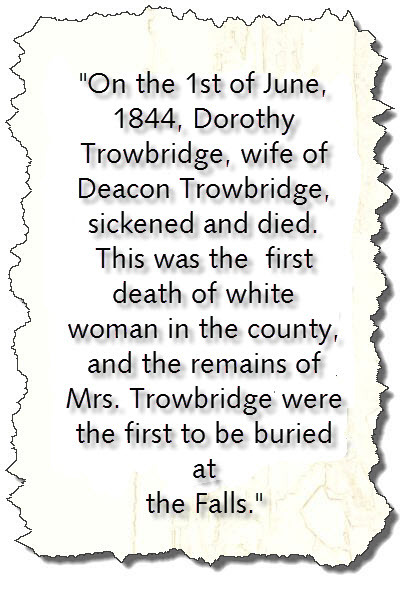 This was in 1855. His capital amounted to $400 and on his payroll were six men. In 1859 a partnership was effected by Mr. Heyer, with Theodore Zschetzsche. Between them they had $2,000. This combination continued until 1873, when Mr. Zschetzsche retired and began business for himself, being associated with his son, Carl L. They employed about two hundred men. In the year 1866, Adam Harsch commenced the tanning business, employing eight men, and in 1868 J. F. A. Heyn was so engaged. George End became a partner in 1873. In 1877 Adam Schneider, with ten men, was employed in tanning hides. These concerns have all disappeared, but some of them were in a way merged in the present Badger State Tanning Company. The company just named has its plant on South Water street. Its officers are: F. E. White, president; George A. Riddell, secretary and treasurer; Theodore Zschetzsche, vice president; Fred Zschetzsche, superintendent. In 1868 Captain Watson D. Crocker, in company with the Bemis brothers, began the manufacture of chairs in a small way, under the firm name of Bemis Brothers & Crocker. This co-partnership lasted a year, when in 1869 the firm of Crocker & Bliss was established and the capacity of the plant was greatly increased. When the business was begun only two hands beside the members of the firm were employed, while the new firm gave employment to about thirty-five. In 1874 the Crocker & Bliss factory was destroyed by fire, which entailed a total loss. The firm was dissolved and in 1875 Mr. Crocker became the superintendent of the Phoenix Chair Company, with which he remained until 1880. Not discouraged by his loss, Mr. Crocker decided to organize a new company. As a result, the Crocker Chair Company was incorporated in 1880, with a capital stock of $30,000, which was increased in 1885 to $60,000, and in 1887 to $100,000. The first officers of the company were: J. H. Mead, president; J. D. Stearns, secretary; W. J. Rietow, treasurer; and W. D. Crocker, superintendent and manager. This factory is one of the largest in the state and controls two factories, "A" and "B,'' which cover an area of several acres of ground and gives employment to several hundred hands. Factory "A" is located at the comer of North Eighth and Virginia avenue and Factory "B" is located at the comer of Maryland avenue and South Eleventh street. The present officers are: C. W. S. Crocker, president; William J. Rietow, vice president; E. A. Zundel, secretary; W. A. Knilans, treasurer; and W. J. Hoehle, assistant secretary. The Phoenix Chair Company is one of the oldest industries of its kind and one of the most important in Sheboygan. It was organized in May, 1875, with a capital stock of $50,000. Thomas M. Blackstock, who has long been president of the company, was one of the chief promoters of the enterprise. At the time of the organization the company gave employment to seventy-five hands. In 1888 ,the capital was increased to $300,000, which has later been increased and the employees now number several hundred. The factory proper consists of the main building, 50 X 350 feet, having three "Ls" 50 x 100 feet. There is also a brick-veneered warehouse 40 x 150 feet. The buildings are all brick and five stories in height. The goods manufactured at this magnificent plant have an extensive sale and wide reputation. They are located at South Twelfth street and Virginia avenue along the tracks and near the depot of the Northwestern railroad. The present officials are: Thomas M. Blackstock, president . and manager; Francis Williams, vice president; A. C. Hahn, secretary; E. S. Voigt, treasurer. The Sheboygan Chair Company was incorporated in 1888 and has become one of the largest concerns of its kind in the city. The plant extends from the lake front to 720 Indiana avenue. The officers are: William Braasch, president and general manager; Thomas McNeill, secretary and treasurer. The American Manufacturing Company is another large concern, employing about two hundred hands in the manufacture of chairs. It was incorporated in 1887, with a capital stock of $60,000. Fred Koehn is president, and Henry Koehn, superintendent. The George Spratt Chair manufactory is at the foot of South Sixth street. George Spratt, the proprietor, commenced this industry in 1891. The business has kept pace with the growth of the city since that time and a large number of hands is employed to meet the orders that tax the capacity of the factory. The Frost Veneer Seating Company was incorporated in 1884, with a capital stock of $200,000. It employs several hundred men. The factory is at II South Water street. George E. Frost was president of the corporation up to the time of his death in April, 1912. C. A. Knudson is secretary and treasurer; W. C. Calhoun, manager. This concern manufactures railway and depot seating, settees and stock of various kinds. G. B. Mattoon in 1881 employed about fifteen men in the manufacture of furniture. The business increased so rapidly that a corporation was organized under the title of the Mattoon Manufacturing Company, with a capital stock of $300,000, which was afterwards increased to $500,000. They employed about six hundred hands. Upon the death of George B. Mattoon, which occurred some four or five years ago, the company was reorganized under the style name and title of the Northern Furniture Company, whose present officials are: G. Huette, president; E. E. Pantzer, vice president; George J. Posson, treasurer; Carroll Quimby, secretary. The factories are at the corner of New Jersey avenue and South Water street. The Sheboygan Novelty Company was incorporated in 1890 with a capital stock of $30,000. The chief products of the concern are bookcases and cabinets. About seventy-five hands are given employment. The officers are: W. S. Piper, president; A. S. Freyberg, vice president; A. F. Piper, secretary and treasurer; A. Freyberg, manager. The shops are located on Pennsylvania avenue between Fourth and Fifth streets. The Dillingham Manufacturing Company was incorporated in 1889 and capitalized at $100,000. It specializes in refrigerators and cabinets. From one hundred and fifty to two hundred hands are employed. The establishment is on the corner of Wisconsin avenue and South Water street. The officers are : A. D. Barrows, president ; Otis H. Qark, vice president; Harry Barrows, manager. The M. Winter Lumber Company is a large concern that manufactures office fixtures and interior wood work. The offices are located at 401 North Eighth street. This company was incorporated in 1890, with a capital stock of $100,000, and employs a large force of men. The H. G. Mueller Manufacturing Company is located at the corner of North Sixth and East Water streets. It was incorporated in 1898, with a capital stock of $32,000. This concern deals in limiber and manufactures woodenware. The Advance Furniture Company, located in Lyman's addition, the Art Furniture Company, Lyman's addition, and the American Parlor Frame Company, South Water street, should be added to the list of industrial concerns making Sheboygan so widely known. The Garton Toy Company was incorporated in 1887 and capitalized at $50,000. This is one of the important manufacturing concerns of this city and employs probably three hundred hands, in the manufacture of toys, children's express wagons, sleighs and the like. The officials are: E. B. Garton, president; Clarence E. Garton, vice president and manager; R. L. Whitehill, secretary and treasurer. The factory is at the corner of North Water street and Niagara avenue. The enameling of iron ware has become a great industry of Sheboygan and the one to whom all credit is due for its inception at this place is Jacob J. Vollrath, a native of Germany, who settled in the city of Sheboygan in 1853, at which time he formed a partnership with the firm of Boehmer & Marling, for the manufacture of agricultural implements, which continued about two years. The following three years he was building steam engines in company with others but through the dishonesty of a partner he lost the fruits of former years of toil and saving. It was not long, however, before he was again manufacturing farm implements, having formed a company, the firm name of which was Vollrath, Blocki & Company. In 1874 Mr. Vollrath began the manufacture of enameled ware and to him is g^ven the distinction of being the first to invent the gray enameling. Through his invention of this process and his manufactured products he gained a world wide reputation. The business grew rapidly from the start and in 1884 a stock company was formed, known as the Jacob J. Vollrath Manufacturing Company. An immense plant was built at the comer of Michigan avenue and North Sixth street, where at least two hundred hands have been employed. The company secured a large tract of land at North Eighteenth street between Superior and Erie avenues, contiguous to the Northwestern railroad, where it put up large buildings and to which locality the company anticipates within a short time moving its buildings from the Michigan avenue site, as the ground there is more valuable for residence purposes and too far from the railroad. The officials are: C. A. W. Vollrath, president; W. J. Kohler, vice president; F. S. Morris, treasurer; D. F. Riess, secretary. The Porcelain & Enameling Association of America manufactfees porcelain ware and is a company organized by the Vollraths. The factories are located at North Fifteenth street and employs a large number of men. The officers are : A. J. VoUrath, president; A. M. VoUrath, vice president; W. J. VoUrath, treasurer; and A. J. VoUrath, Jr., secretary. John M. Kohler, founder of the J. M. Kohler Sons Company, was born in Austria and came to this country with his parents in 1854. He arrived in Sheboygan in 1871, and in 1873 started a foundry and machine shop, making agricultural implements. At the beginning a small plant was sufficient but business so increased it was found necessary to enlarge the establishment in 1883. ^^ ^^e same year he commenced the manufacture of enameled ware. In 1888 the Kohler, Hayssen & Stehn Manufacturing Company was incorporated, with a capital stock of $75,000, the officers being: John M. Kohler, president; H. Hayssen, vice president; A. Bachmann, secretary and treasurer. The concern is now known as the J. M. Kohler Sons Company. The present officers are: Walter J. Kohler, president and treasurer; J. B. Murphy, vice president; O. A. Kroos, secretary. The plant and offices are at Riverside. In 1876 David S. Jenkins, with his son De Witt, opened a machine shop on ground now covered by "Factory A" of the Crocker Chair Company, the building being a small affair 30 x 60 feet. In 1880 Mr. Jenkins built the works where the business is now carried on at 301-315 North Eighth street, under the name of the Jenkins Machine Company. The plant has been improved from time to time, and equipped with the latest machinery. It is one of the best appointed establishments of the kind in the state. The products of the factory are wood-working and other machinery. In 1887 the Jenkins Machine Company was incorporated, with a capital stock of $70,000, and had for its officers David S. Jenkins, president and treasurer; and Thomas A. Long, secretary. The present officers are: William W. Wolf, vice president and manager; Thomas A. Long, secretary; M. A. Long, treasurer. The Globe Foundry & Machine Company is an old established concern and is located at the corner of Pennsylvania avenue and Ninth street, where is manufactured machinery. The foundry was established in 1847 by E. J. Smalley and finally came into control of the late Henry Foeste. The Optenberg Iron Works manufactures boilers and engines. The shops are on the comer of South Seventh street and Clara avenue. The officers are: J. H. Optenberg, president; William Mueller, vice president; A. Busse, secretary and treasurer. The wagon works of J. & W. Jung and of John Balzer manufacture wagons as well as carriages, etc., and keep a number of men steadily employed the year round. There are a large number of industries in Sheboygan but all of them cannot be given special mention. Those which should not be neglected in this regard, however, are the two large breweries which turn out a bever- age that commands a large sale over a wide territory. The Gutsch Brewing Company was established by twin brothers, Leopold and Francis Gutsch, in a frame structure 40 x 60 feet and two stories in height on the northwest comer of New York and Water streets, in 1847. The business was continued under the name of Gutsch Brothers until 1878, when Francis sold his interest to Leopold. In 1885 Adolph F. Gutsch bought out his father and in 1888 the Gutsch Brewing Company was organized. The buildings of the plant are on the northeast comer of North Water street and New York avenue and since extensive repairs were made in 1912 is one of the best appointed and equipped establishments of the kind in the state. The Gutsch brothers who established this concern were bom in Baden, Germany, in 1819. They came to the United States and after working in a brewery at Cincinnati, Ohio, a year or two in 1847 came to Sheboygan. A more complete sketch of these brothers will be found in the second volume of this work. Konrad Schreier Company, brewers and malsters, comer New Jersey avenue and South Fifteenth street, has a finely equipped and large plant in the city of Sheboygan and its beer is very popular in this section of the state. The "Edelbraeu," which is put up in bottles, is especially attractive to the lovers of this beverage. The members of this corporation are: Herman Schreier, president; Alfred P. Steffen, vice president; Konrad Testwuide, treasurer; Louis Zimmerman, secretary. The brewery was established by Konrad Schreier in 1854. Casual mention is herein made of the Sheboygan Broom Factory at 639 South Division avenue and of Alfred Heller, 1716 South Fourth street; the A. Landreth & Company canning works, an institution of no little importance to the community, the Sheboygan Cigar Box Factory on North Ninth street, and a large number of cigar manufactories. The Excelsior Wrapper Company, 1634 Erie avenue, is a large concern, and is running to its full capacity to meet incoming orders; the Rietow Furniture Manufacturing Company, 814 North Eighth street; the Sheboygan Couch Company, corner Martin and North Eighteenth street; and the Westem Fumiture Company. There is also a glove manufactory enjoying a liberal patronage, with factory on the corner of South Ninth and South Water streets. The Handknit Hosiery Company, comer Huron and North Fourteenth streets, since its establishment has increased its facilities and is established in a large brick building. The officials are: Herbert Chesebro, president and manager; L. A. Bentz, vice president; R. H. Ehaney, secretary and treasurer. The manufacture of lime is also largely engaged in by the Sheboygan Lime Works, at their plant on the Calumet road, north of the city limits. There are three overall and jacket manufacturing concems: A. Holman & Son, 21 18 North Fifteenth street; H. J. Holman, 1716 Calumet road; Holman Manufacturing Company, 920 Michigan avenue. The S. W. Miller Piano Company, with factory at North Fifteenth street, turns out superior instruments. Sheboygan county is noted for the excellence of its dairy products, the more particularly, cheese. For the latter product this county has gained world-wide fame and a market ever ready and eager to secure every pound of the article made. And when one considers the popularity of the Sheboygan cheese and is told that Hiram Smith, at the time a manufacturer in a small way on his farm, had difficulty in disposing of the output of his factory a few decades since, one to the manner born swells up with pride at the present status of the county in Cheesedom and can only feel that the obtuseness of the Chicago cheese dealers of the nineteenth century surpassed all understanding indeed. Sheboygan cheese does not go begging for a market in this day and generation, but the market, practically, looks up the cheese. At the Sheboygan fair, held in 1857, N. C. Harmon, of Lyndon, was awarded first premium on his exhibit of cheese, the first issued by the Agricultural Society. The next year John J. Smith began collecting curd and milk from his neighbors and made the first vat of cheese. Hiram Smith, of Sheboygan Fallstown, started a cheese factory in 1859, and took fifty boxes to Chicago, and after many dickerings, refusals and indifferent inspections of his product, succeeded in disposing of the lot at 8 cents per pound. This marked the beginning of the manufacture and exportation of Sheboygan cheese. By 1875 there were upwards of forty-five cheese factories in Sheboygan county whose output aggregate^ 2fi^.6oo: ppunds. In 1900 there were about one hundred factories producing amflialiy' ^o^ct^ooo pounds. In 1912 the industry shows no diminution and the products reputation and popularity is still in the ascendant. Early in the present year, Oscar Damrow, of Sheboygan Falls, was made president of the State Cheese Makers Association, very likely in recognition of the position the county holds as the great cheese making center of Wisconsin. The village of Riverside, about two miles west of the city limits, sprang into existence in 1899, when the J. M. Kohler Sons Company planted its new factory there, on land which formerly was part of a one hundred and thirty-five acre farm, owned by N. J. Balkins. Soon thereafter a plat of the village was made by Mr. Balkins and at the present time there is a population of some 300. 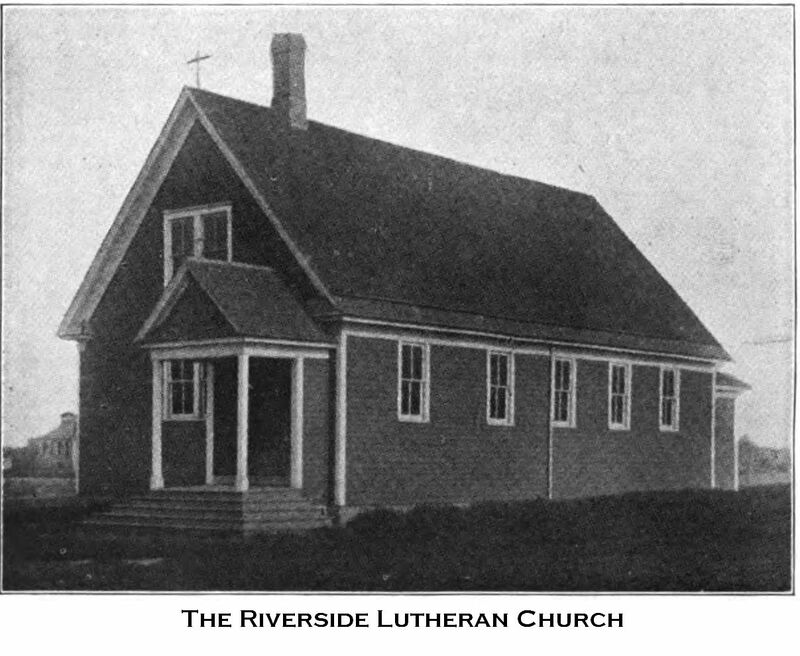 On Sunday, June 13, 1909, the church of the New Lutheran Missionary congregation was dedicated by Rev. Burger of Sheboygan, and Rev. George Wildermuth, of Sheboygan Falls, assisted by Rev. Halboth, who preached the dedicatory sermon.